Kottayam District Pravasi Association Kuwait (KODPAK) is celebrating 3rd-anniversary celebration on Friday, 26th April 2019-4.00 P.M at Marina Hall, Abbasiya, Kuwait. His Hon. Sheikha Salem Al-Hamoud Al-Sabah is expected to inaugurate the anniversary celebration titled "Kottayam Fest 2019"
The Celebration will be blessed by Dr.Barrak Al-Noon Ex.MP Kuwait Parlament, Rosshan Andrews South Indian Film Director as chief guest. 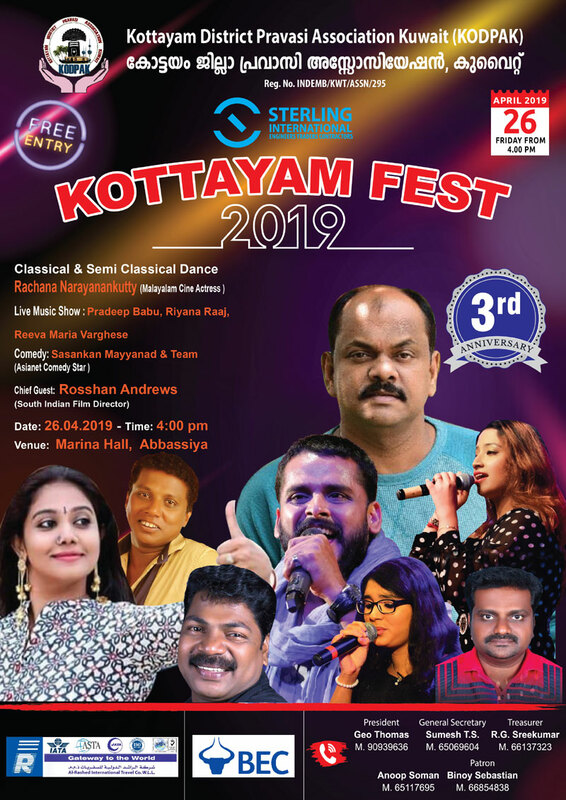 There will be a colourful cultural extravaganza with Classical & Semi-Classical Dance performances by the famous Malayalam Cine Actress Rachana Narayanankutty, Live Music Shows by Pradeep Babu, Riyana Raj & Team, Comedy Performances by Sasankan Mayyanad & Team.